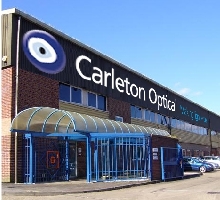 Carleton Optical, founded over 30 years ago, is a privately owned company located in 6500sq ft premises in Chesham, Buckinghamshire. These premises boast office, distribution, warehousing, fully equipped showroom, conference and servicing centre facilities. The company is dedicated to offering ophthalmic professionals an extensive range of high-quality diagnostic and surgical equipment, precision instrumentation and consumables, supported by unsurpassed technical experience and after sale service and support.Carleton Optical proudly exclusively represents many leading international ophthalmic brands, including; Canon, Iridex, Reichert, Sonomed and Takagi. Our portfolio reflects our objective to establish enduring partnerships with ophthalmic manufacturers whose products compliment and enhance each another. Our enviable reputation for offering exceptional quality at competitive prices, backed by renowned and respected customer care in hospitals, clinics and practices, can be attributed to our knowledgeable workforce - The Carleton Team - having over 100 years combined experience in the ophthalmic field. This experience enables us to offer unsurpassed presale consultation and project management, as well as reliable installation, staff training, and ongoing technical support. Our comprehensive maintenance and repair programmes maximise investments made and minimise any downtime. Our commitment to establishing enduring partnerships extends from our manufacturers to our customers. Carleton Optical maintains a high profile at all the major ophthalmic and optometric exhibitions and conferences in the UK and abroad to introduce the latest technologies as well as consult with ophthalmic professionals regarding advances and changing needs in the marketplace.